A slide in the Chinese yuan is sparking fears of a sharper devaluation that could rattle global markets. Are the worries justified? We see the yuan depreciating moderately in response to slower growth, financial deleveraging and escalating trade tensions. We expect China to rely mostly on fiscal and monetary tools, rather than the currency, to manage any growth slowdown in the second half. The Chinese currency posted its biggest monthly fall against the U.S. dollar on record in June - just as the trade tussle between China and the U.S. heated up. The yuan has slid 4% so far this year, with the fall accelerating since mid-June when U.S. President Donald Trump announced a 25% tariff on $50 billion of Chinese imports. See the blue line in the chart above. We do not see China resorting to a 2015-style devaluation to cushion the blow. Back then, a lack of market confidence in China’s policy framework contributed to capital flight (see the green bars), spooking global markets. Today, China has stricter capital controls in place – and improved coordination between policymakers. We believe this should give the government confidence to allow the yuan to gradually slide lower. Download BlackRock's complete weekly commentary here for the chart of the week showing the changes in China's FX reserves vs. the yuan exchange rate. The policy, regulatory and growth dynamics in China today are different from 2015. Authorities have become more coordinated in their approach to fiscal, monetary and FX policies; China’s economy is in a better place – and so is the global economy. Beijing has policy tools at its disposal to prop up the economy, with potential for more monetary easing and fiscal spending in the second half. The People’s Bank of China’s (PBoC) recent move to boost market liquidity is one such example. We also take comfort in the PBoC governor’s pledge not to use the currency as a weapon in potential trade wars. A sharp yuan depreciation would undermine Beijing’s deleveraging effort, by driving capital flight and further tightening domestic financial conditions, in our view. It could also fuel inflation and dampen foreign investors’ growing interest in China’s domestic stock and bond markets. indexes as opportunities for global investors to gain exposure to China’s consumer market. We are neutral on rates and credit in China. Department of Commerce hearings suggested widespread opposition to car import tariffs. U.S. banks reported strong second-quarter earnings. Financial stocks led the U.S. market up. European equities firmed, led by autos and chemical stocks. China’s onshore A-shares weakened. disappointed. Weak data and concerns about Brexit helped push the British pound lower against major currencies. 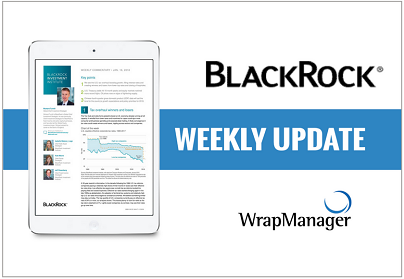 Download BlackRock's commentary now for an overview of specific economic events to watch in the week ahead and to review their Asset Class Views from a U.S. dollar perspective over a 3 month horizon.